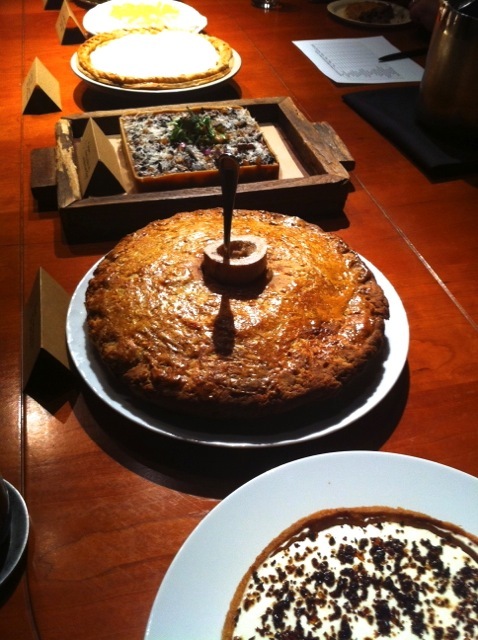 Last week I posted a brief entry about tasting 17 pies at Gramercy Tavern, New York City, for an in-house staff pie contest, promising more details. 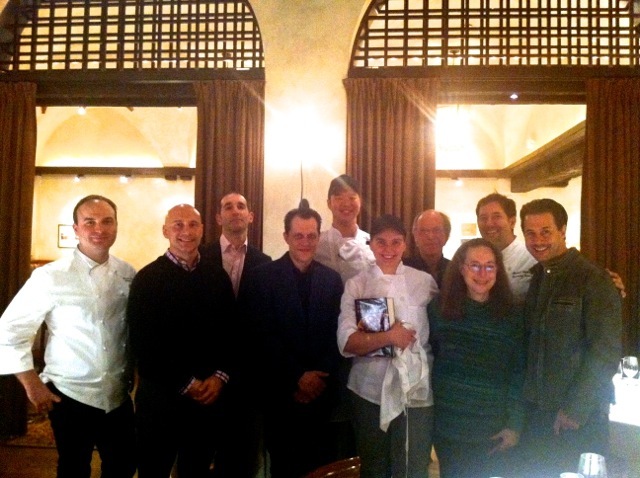 Pictured above are the judges, the two winners, Gramercy pastry chef Miro Uskokovic and executive chef Michael Anthony. It was very touching how enthusiastic the staff was, especially to have us all as judges, while we, the judges, felt honored and privileged to be there. Three of us judges were pastry chefs: Johnnie Iuzinni, Michael Laiskonis, and me. Also judging was Niko Triantafillou of DessertBuzz, a staff member from Danny Myer's Hospitality Group, Chief Restaurant Officer Sabato Sagaria, and Woody. 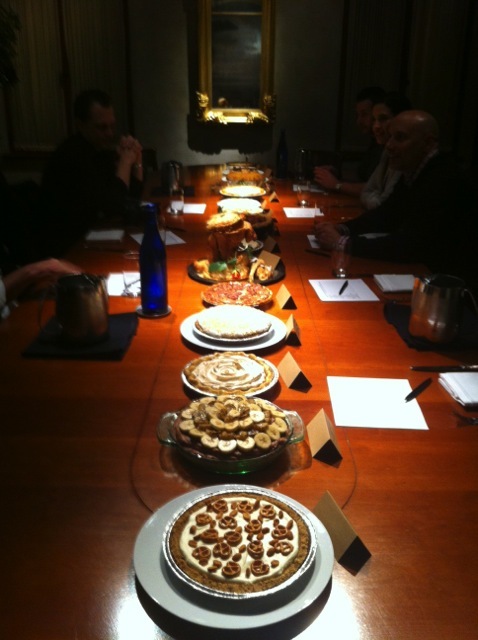 A long table in one of the private dining rooms held all of 17 stunningly different pies, from sweet to savory. Each place setting held a score card with categories to judge the pies for best overall pie and most creative. 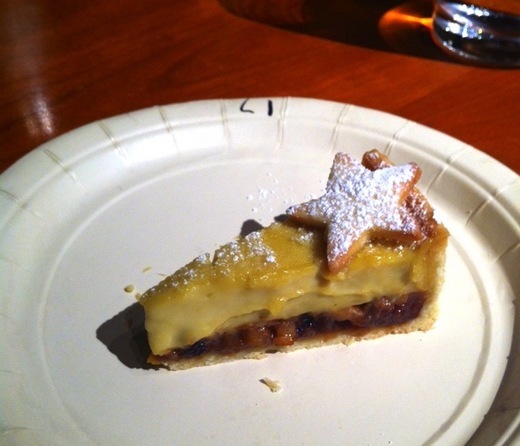 The most amazing looking pie was presented atop a magical pastry tree. It was delicious as were all the pies. Some, however, were more daringly experimental in concept than delicious. Choosing the winners was not easy but was accomplished by a tally of all the judges. My personal favorite pie was made by a pastry chef from Scotland. Though I'm not a big fan of mincemeat, this version was nothing short of fantastic because, not only did she make her own mincemeat, using an impressive amount of brandy, she also topped it with a layer of brandy imbued cream filling which put the sweetness of the mincemeat in perfect balance. 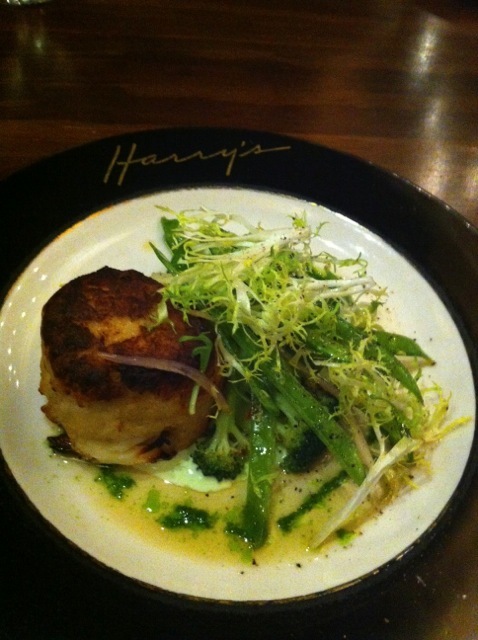 One of the most creatively clever pies was called a Tapas Pie. 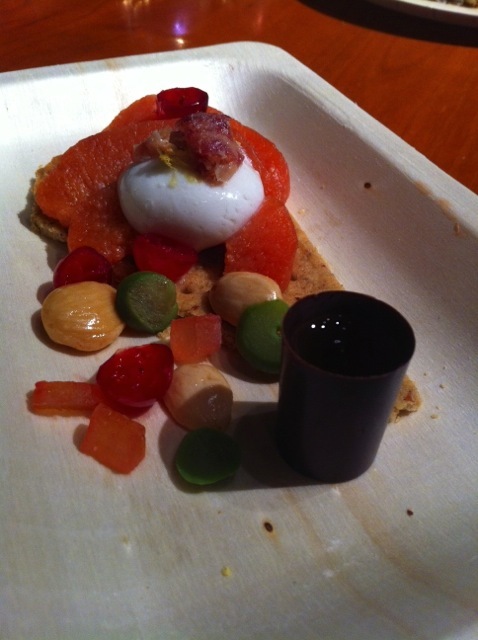 It was a combination of sweet and savory, which included red grapefruit sections, marcona almonds, little cubes of bacon, and an exquisite little chocolate cuplet filled with sherry. The pie that took all of our breaths away on first appearance was a savory beef stew pie with a marrow bone in the middle and pie crust made with beef suet. It was also delicious and a great reprieve from all the sweetness of the other pies, in fact, many of us kept going back to it for another nibble. The overall winner, however, was the square-shaped wild mushroom pie pictured behind the beef stew pie, made by sous chef Junsoo Bee. (This was Woody's top choice.) The winner of the most creative pie was pastry sous chef Gezina Plumb, for her deeply delicious Concord grape pie accented with rosemary. When I admired her pie crust, she told me it was my favorite cream cheese pie crust from The Pie and Pastry Bible. I was especially moved by her response to winning in this category as I don't think I've ever seen anyone express joy so fully and with such charm. 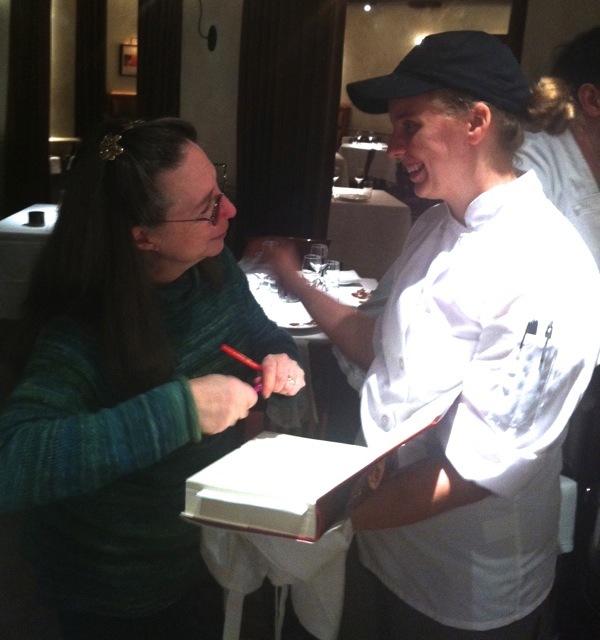 Happily I brought a copy of The Pie and Pastry Bible as a prize, which I signed. The presentation pies were served at the staff supper. 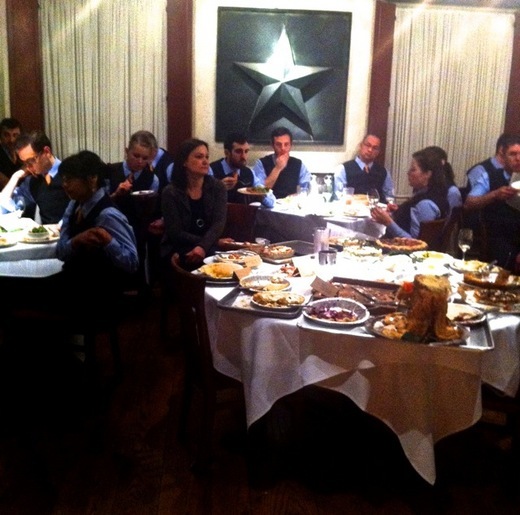 This is a nightly event in which the staff learns about any special guests on the reservation list, the food being presented that night, tastes a special wine being offered, and eats their evening meal before the restaurant went into full swing for the evening patrons. Pastry chef Miro told us that the participating staff was so enthusiastic they actually came in on their day off to create their pies and worked into the night to produce one for the judging and one for the presentation. 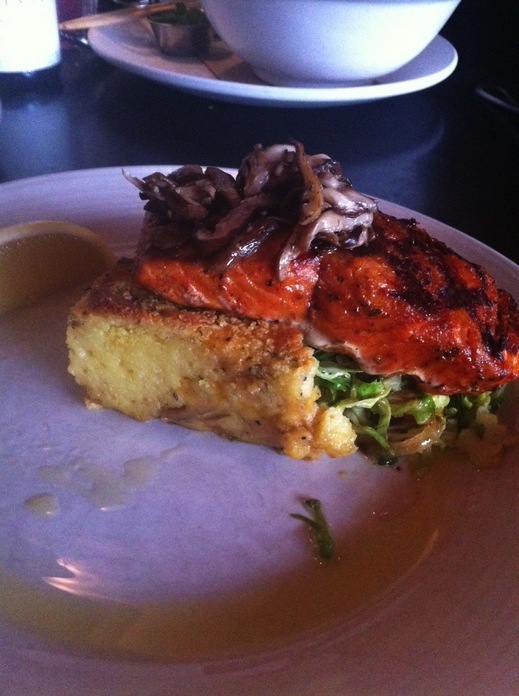 The event was so successful Miro and Mike said they would do it again next year, and invite us!